In an effort to try and be more domestic, I've been cooking something every weekend. For the past three weeks I've used the oven to heat up appetizers such as spinach bites, pierogies, and jalapeno poppers, but this time I wanted to make something that was a little harder. At the Wayside General Store in Marlboro yesterday, I spotted a small envelope of no bake cake mix by Halladay's Harvest Farm ($3.99). 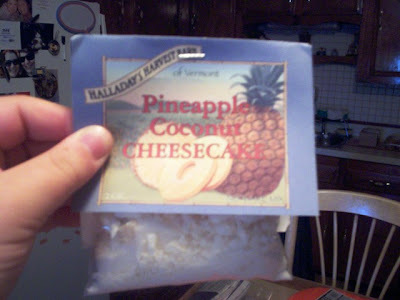 The pineapple coconut cheesecake pack looked interesting (it contained only the flavoring), and when I read the recipe, it seemed pretty simple. The only things I needed to pick up were a block of cream cheese and a ready-made pie crust. The third ingredient was Cool Whip, but we always keep that on hand. 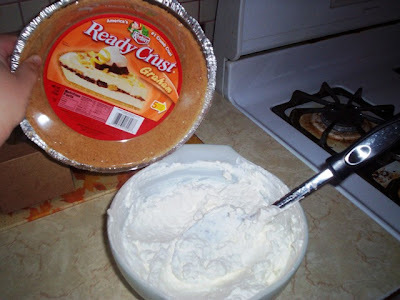 When I awoke this morning, I attempted to make the pie. STEP ONE: Mix eight ounces of cream cheese with the contents of the package. 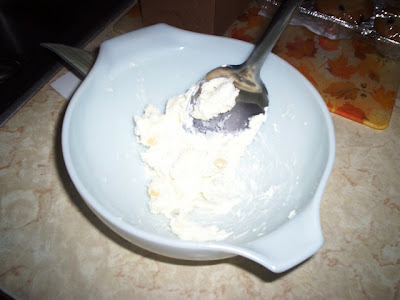 STEP TWO: Flip out because the cream cheese is extremely hard to move around the bowl. Also, complain loudly about how the instructions should have warned you about this, and how untrained chefs would not know that they should soften the cream cheese before working with it. STEP THREE: Once you've broken your wrist blending dry cream cheese with a dry flavor packet, fold in eight ounces of Cool Whip. 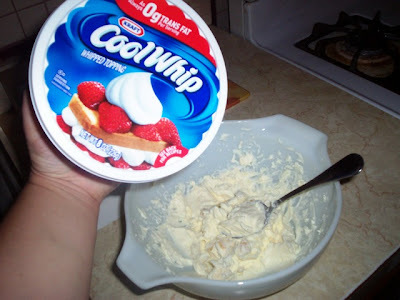 STEP FOUR: Flip out again because the Cool Whip is white, and now you can't tell if your cream cheese has blended with the Cool Whip, or if it's hiding in there in big clumps. 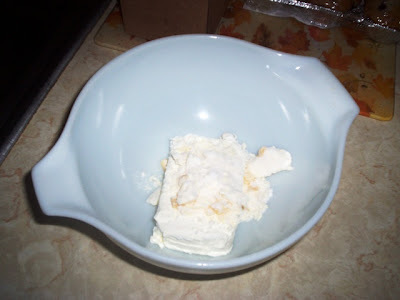 STEP FIVE: "Pour" (yeah, right) the mixture into the ready-made pie crust. 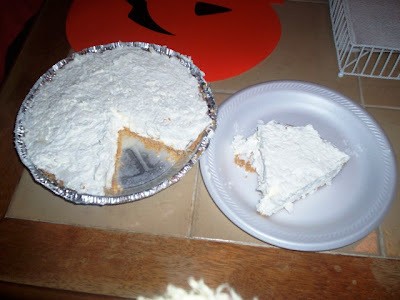 STEP SIX: Try not to get Cool Whip along the edges of the tin (oops). 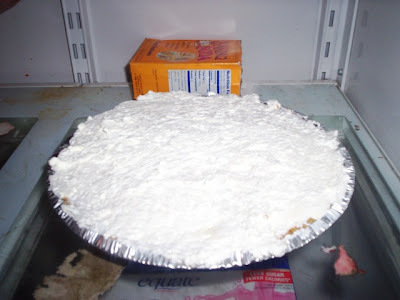 STEP SEVEN: Put the pie in the refrigerator and let it chill. STEP EIGHT: Cut and serve to your nervous family members. THE VERDICT: Pretty good! Mom and I both gave it a "B +." She liked the consistency because she was afraid that it was going to be wet and gloppy. It was really thick, which was unusual for cream pies. Believe it or not, it actually tasted like cheesecake! Although there were some little balls of cream cheese that still had not fully blended (damn it), we were able to taste both the pineapple and the coconut flavors. 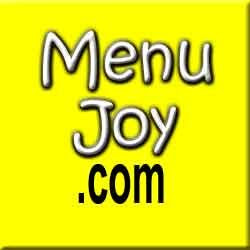 We were impressed that the little package (along with the added ingredients) could be made into a great dessert. Mom and I look forward to trying some of their other products, but this time I'm softening the damn cream cheese. My wrist is killing me!